7/21 Cup of Coffee: The Lowell Spinners and the Portland pitching staff both remained on a roll on Friday. 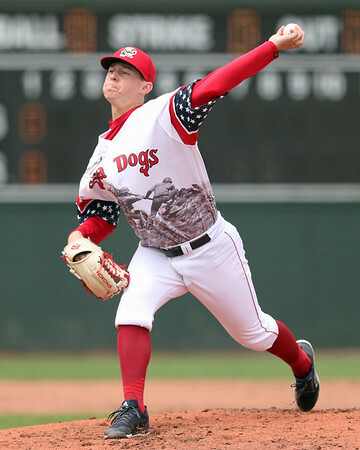 Matt Kent (pictured) and Josh Taylor combined on another shutout by the Sea Dogs, the fifth straight contest in which they've allowed one or fewer runs. Tyler Esplin and Yorvin Pantoja had big nights for the Spinners. Late rallies doomed Pawtucket, Greenville and the GCL squad, obscuring strong outings from Jalen Beeks and Jose Gonzalez. The PawSox led all evening until a six-run outburst in the sixth tipped the scales to Gwinnett. Jalen Beeks got the start, firing 4 2/3 innings and striking out seven. After not having pitched in 10 days and started in 16, the left-hander was pulled after 63 pitches. Robby Scott was touched up for four runs in his 1/3 of an inning, nearly doubling his ERA from 1.08 to 2.14. Scott had not been scored upon in his previous 12 outings. The beneficiary of Gwinnett's big inning was old friend Miguel Socolovich. Kyle Wren broke an 0-for-12 skid, going 2 for 4 with two doubles and three RBI. The Sea Dogs' run of outstanding pitching continues, as their staff has now allowed only two runs total through the last five games. Matt Kent was the second consecutive starter to fire nine shutout innings, following Thursday's effort from Teddy Stankiewicz. Kent scattered five hits, striking out five and walking only one. Josh Taylor struck out three in the ninth to secure the win. Josh Ockimey powered the offense, driving in four runs as part of his 2-for-4 evening. Jhon Nunez added his second round-tripper of the season, a two-run shot in the fourth inning. The Sox dropped the rubber game of their three-game set with the Astros as the offense was held to four hits while striking out 15 times. Three of Salem's four hits came off the bat of Michael Osinski, who raised his average to .324. Bobby Dalbec missed out on his daily extra-base hit but did score the lone run after a walk. Daniel Gonzalez took the loss, allowing four runs in six innings. A four-run sixth inning doomed the Drive and starter Jhonathan Diaz. Diaz, who entered with a 2.08 ERA in his previous five starts, was cruising again Friday evening with just one run allowed through five before the Tourist offense broke through. A resurgent Pedro Castellanos tripled to extend his hitting streak to nine games. Tanner Nishioka and Ryan Fitzgerald both delivered solo homers for Greenville. The Spinners won their 11th straight, taking the opener of their series in Brooklyn. Yorvin Pantoja pitched around some control trouble, as he walked four and hit a batter in his five frames, but surrendered just one hit as the Cyclones could not capitalize. Tyler Esplin homered for Lowell as part of a two-hit evening. Jarren Duran was again a catalyst out of the leadoff spot, going 1 for 3 with a walk and a pair of stolen bases. The Twins rallied for three runs in the seventh, spoiling a strong start by Jose Gonzalez. Gonzalez went five innings, allowing an unearned run on two hits, striking out two and issuing a walk. Zach Schellenger followed with a scoreless inning of his own as the 2017 sixth-round pick made his third rehab appearance. At the plate, Chad Hardy delivered a solo homer, is four of the season. Brandon Howlett doubled, giving him six in 17 games as a pro. The Sox managed only four hits and did not advance a runner to third base until there were two outs in the ninth. Ceddanne Rafaela singled and stole his 12th base of the season. After starter Jesus Rosillo allowed a pair of first-inning runs, the Sox bullpen turned in a strong effort. Cristofe Tineo gave up two runs (one earned) in 4 1/3, striking out five. Jose Larez followed with three scoreless frames. Like the other DSL affiliate, the Red Sox2 squad didn't get a player as far as third base until the ninth inning. However, when Andres Gari did reach third, it was while racing home with the winning run on a Gabriel Quintero double. Quintero's game-winner was the only extra-base hit of the day for the Sox. Each of the three hurlers went three scoreless innings apiece, with starter Jose Ramirez not allowing a hit and striking out four while also walking four batters. Player of the Day: The Portland rotation has been unstoppable recently, and Matt Kent turned in another entry in that saga on Friday. It was also the second straight start in which Kent had completed eight innings. The left-hander lowered his ERA to 3.44, and his five strikeouts without walking a batter give him 89 punch outs against only 26 free passes in 99 1/3 innings.